To heat a typical house with oil produces 6.2 tonnes of CO2 per year. To heat the same house with wood produces 0.1 tonnes of CO2 per year. Whether we put another log onto the fire or turn the central heating up a couple of degrees has an impact on the environment beyond just keeping us warm. We have an obligation to the environment and its future. The carbon trust gives examples of how many Kg of CO2 is emitted into the atmosphere from the average family home in the UK. Advances in technology have pushed wood / solid fuel burning stoves into the 21st century. With efficencies running as high as 90%, wood burning stoves not only are a beautiful focal point in any room, but completely carbon neutral. Timber is a carbon neutral fuel. It absorbs as much carbon whilst growing as it releases when burnt. Leaving wood to rot naturally releases as much carbon dioxide as it does when used for burning as a fuel. Wood is definitely the fuel for the future, with ever increasing prices of gas, oil and electric. Everybody agrees that modern day wood burning stoves incorporating the latest clean burn technology not only look great but will heat your home very efficiently. Burning wood is a very cost effective way of heating your home whilst being environmentally friendly. Heating with wood is not only environmentally friendly, but can make good economical sense. Timber for fuel is typically up to 30% cheaper than oil or gas and with recent price rises in both, the savings are only likely to increase. An additional environment benefit is that timber is usually sourced locally, so transport miles and associated emissions will also be kept to a minimum. Wood burners operate at around 75% efficiency meaning that 75% of the heat generated by burning the wood is radiated out into the room and only 25% is lost up the chimney. By comparison an open fire is likely to operate at around 15-20% efficiency – so to get the same heating effect an open fire will need four logs for every one put into a burner! In many urban areas your local authority may have a smoke control zone which is linked to your post code. 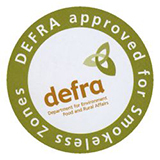 This does not mean that you cannot have a wood-burning stoves but it would need to be either defra approved or choose a stove with an additional smoke control kit.